© Copyright John Palmer. This is work in progress, last updated 2019-03-19. Please use this link to send me comments and suggestions. desc RIB: frag of a tombstone of PM 6 x 7 x 1.75in thick found 1846 in Clock Lane S of Walbrook D[is].MA[nibus].PRIN...VIX[it an(nos)]..
comment Haverfield linked this with RIB 77 and 78.
desc frag PM slab 3 x 3 x 3/4in. SA..NI L(ibertus) S..
desc frag of a PM slab 4 1/2 x 3 1/2 x 2in, left edge rounded. A [..| SA[..
desc frag of PM slab 3 1/2 x 4 x 1 1/2 in, ]V[..|.]VI[.. desc Fragment of PM with inscribed L. Found while cleaning the site during the first few days of the 2001 season. date ? 1st cent. AD? desc Fragment of PM with inscribed P, recovered 2002 July 20 from "the slot through the north-south road". desc inscr. on uncertain building dedicated to Nero, lettering inferior to Cogidubnus' stone: Neroni Claudio divi ..ermanici..
desc Photographed by JP 2000-05-03; The same in negative. Further epigraphic inspection of the stone desirable. loc Displayed at west end of St George's Church, Fordington, Dorchester. Church is open 1415-1530 weekdays and 1030-1200 Wednesdays. Modern stone copy in DORCM, Dorchester gallery (balcony of Victorian hall) west side. comment The only Roman PM inscr. within 50 miles of Purbeck! desc Part of PM tombstone 10 x 8 x 1 1/2in D M ..]UMULO TEG[untur | ossa desid]ERABILIS IUVE[nis ?cuncti? MUC[ianum ..]ERUNT SER[..]UM[..
desc RIB: frag from L margin of PM tombst 1 1/2in thick; D M AR..RE..VAL [COH] I VA(NGIONUM?) .. QUI M[ILITAVIT].. EX A[ERE COLLATO..
date As Titus is called `cos. design.' and he wasn't consul in 81, the inscr. must be from 79, and after his father's death on June 24 that year. publ Wright RP, Richmond IA 1955, Catalogue of the Roman inscribed and sculptured stones in the Grosvenor Museum, Chester, Chester and N Wales Archaeol Soc. desc RB in 1991: Fragment of a PM inscription 125mm x 125mm x up to 28mm thick, found 1991 with late C2/early C3 material ina pit c.300m N of the N defences of the town: [..]NI * M[...|...] * PP? desc Frag of PM inscr 0.11 x 0.06 x 0.05m, reused in makeup layer for a pitched (sic) store surface with late 2nd cent. pottery. 2 lines survive: .]ILIII.|.]VID?[. desc Frags of inscr PM together measuring 0.48 x 0.39 x 0.028m found (Alec Down) 1978 in a pit dug into top of military-type ditch on site of late Roman cemetery outside East gate (south of St Pancras/Stane St). Frags are from RH edge of a 6-sided slab originally 0.825 wide 0.39m high. Surface of stone slightly concave, back roughly dressed except smooth rebates 45mm wide 15mm deep running full width of the stone at top and bottom. Was probably once capped by a second triangular piece of PM and flanked by two more to form a pediment about 1.8m wide 0.65m high. Sections of its moulded cornice were also found and an uninscribed corner-fragment which could come either from the central slab or from one of the 3 subsidiary pieces. Apex will have been a right angle, not the normal obtuse. Central slab carried the inscription: MATRI]BUS DOMEST|[.....] VX ARK|[DS]P : `Matribus Domesticis ...us ark(arius) de suo posuit'. 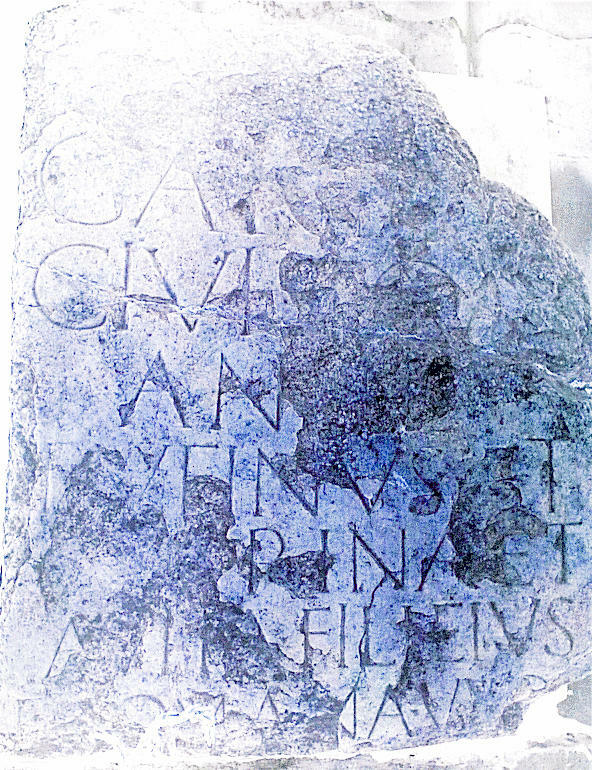 desc Fragment of a PM panel 120 by 241mm by 30mm thick, found 2004 in deposits associated with destruction of a building of mid to late 3rd century, by which time it must have been residual; inscribed in well drawn letters ..|..|PA..|ET..|vacat, perhaps `filio PAter ET mater'? desc Present size, measured by JP from above scale drawing, 569mm high 403mm wide 218mm thick (extreme measurements), height of lettering 52 to 80mm (range). Inspection of the original stone in DCM confirms these measurements; so some of the measurements taken from publications (below) appear to be wrong, especially as to width and thickness. desc 2002: a weathered and somewhat battered inscribed Roman milestone, made of Purbeck limestone ... in the rubble infill of [an] oven ... 0.55m high, 0.23m wide at top, 0.35m at bottom, 0.10m thick at top and 0.18m at bottom ... The sloping RH side is original and shows regular tooling-marks. The bottom alone is a broken edge ... (Hassall and Tomlin 1986 assume that letters may have been broken from the top right but this is not the case.) ... IMP | POSTV | MO AVG | ?G ... Last G may be C or S; meaning of AVGG not clear, as Postumus was not a joint ruler. He ruled the Gallic [breakaway] empire c.260. 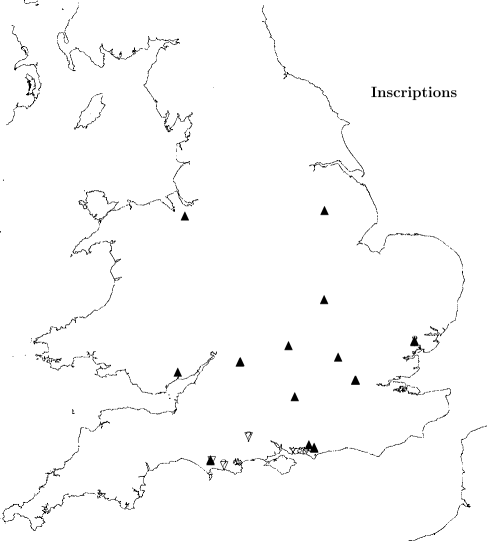 Other milestones to Postumus [not PL] in Wales and Cornwall: RIB 2232, 2235 and Nash-Williams 1969 nos. 7 and 9. The stone may reflect renewed quarrying and mining in 3rd cent. or may simply be from an approach road to Durnovaria. 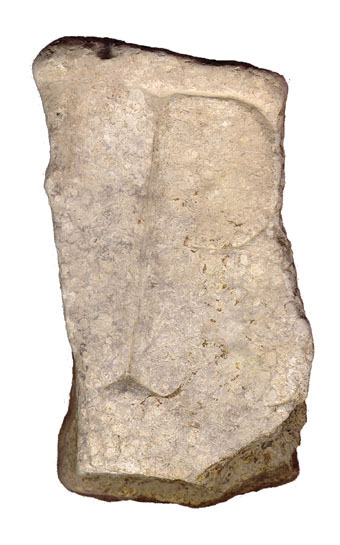 desc Fragment of inscribed PM, very weathered,0.13m x 0.13m: ..]VG[..
desc RB in 1965: Quadrangular milestone of Chilmark sandstone 11 by 20 by 8in, top irregular but probably original, base has broken off, back worn in secondary use. Found 1965 in floor of room VI. IMP CAES C M(ESSIO) Q(UINTO) TRO[IAN]O DE[CIO] AVG, the elder Decius. The younger may have been included on the lower part. 7 other milestone to Decius known in Britain, mainly Yorks and Lancs. TROIANO for TRAIANO also occurs in RIB 2263.
desc Rectangular fragment of a slab of local limestone [identified by Alan Holiday, head of geology at Weymouth College, as probably Portland rather than Purbeck and perhaps from Lulworth or Worbarrow, just S of find site] 0.21 by 0.39m by 47-60mm thick, found late 1988 face down in a ploughed field where many Roman coins and sherds and other objects have been found. 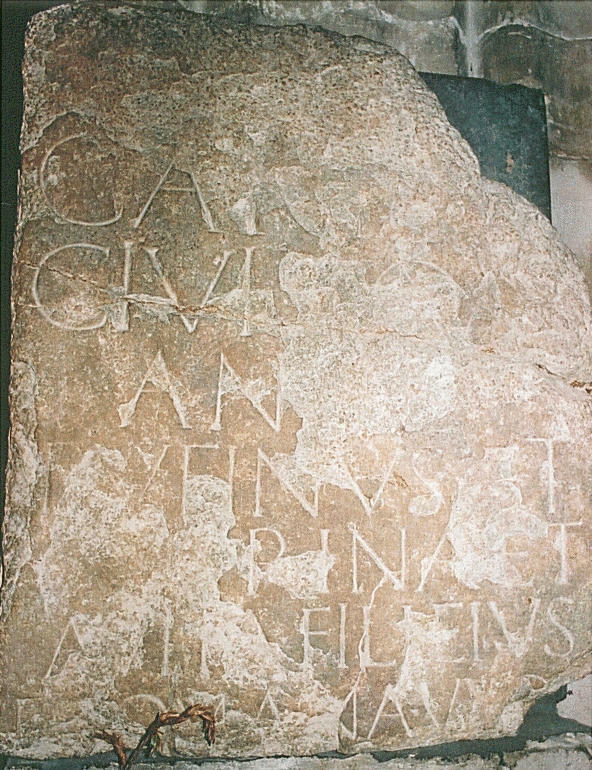 [..]M*|[..]VNDVS|[..]IRALIS|[..] supposed to be part of a tombstone: ?D[is] M[anibus] Verecundus et Liberalis? desc frag of inscr 11mm thick. Four letters survive.